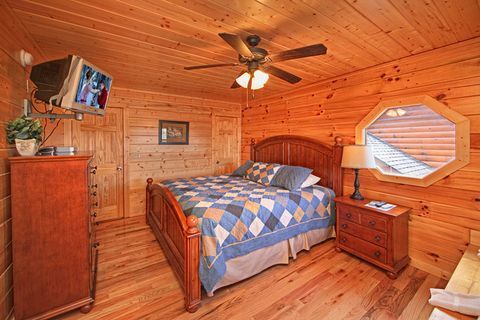 Dollywood Cabin in Hidden Springs Resort - "A Peaceful Easy Feeling"
"A Peaceful Easy Feeling", a Dollywood cabin located in Hidden Springs Resort, places guests less than five minutes from the entrance to Dollywood Theme Park and Dollywood's Splash Country Water Park as well as Pigeon Forge Parkway. 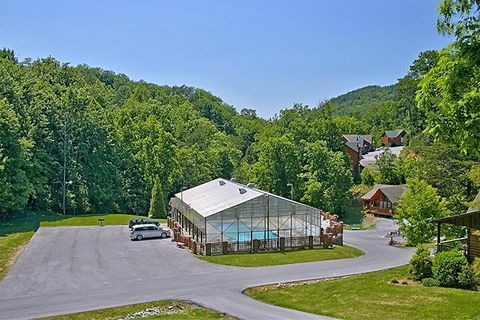 With this great location, there's bound to be enough dinner shows, gift shops, and go-karts for days of exciting adventures! 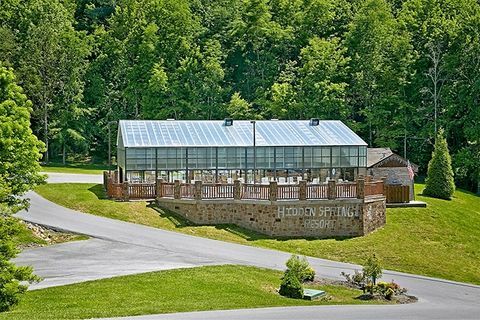 While you can enjoy a convenient location to Splash Country, this Hidden Springs Resort Pigeon Forge cabin provides access to the year-round resort indoor swimming pool as well as access to the outdoor swimming pool in the summer. 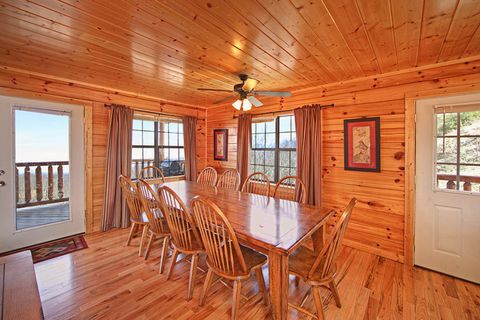 You can also enjoy several comfortable cabin features at your cabin as well. 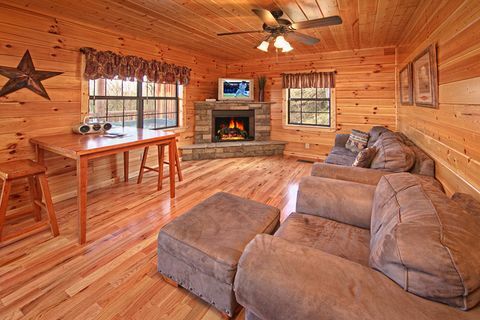 Relax in front of one of the cabin's two stone fireplaces on chilly nights while watching a movie. 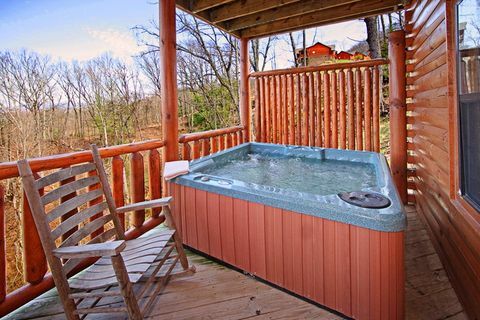 Unwind in the family-size hot tub on the covered porch. 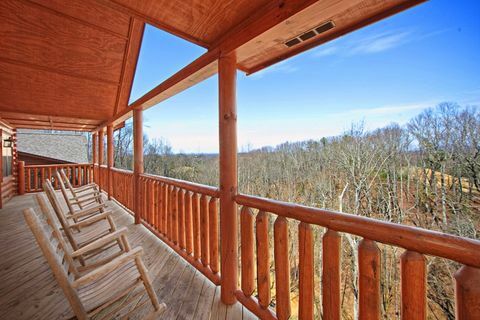 Recline in the rockers and soak in picturesque views of the great outdoors. 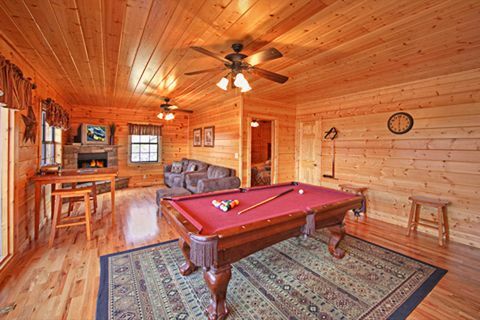 Enjoy a few rounds of pool on the pool table. Start a dance party with the iPod/CD compatible jukebox. 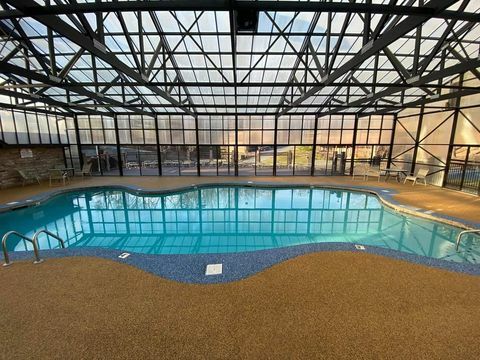 Don't miss the big game with the satellite television! 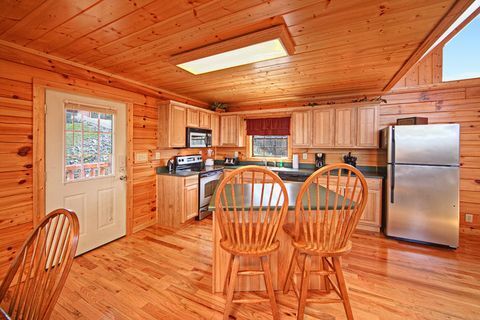 You can enjoy practical conveniences at your cabin escape as well. Cook gourmet meals in the well-equipped kitchen or on the outdoor charcoal grill for cost-effective meals with family. 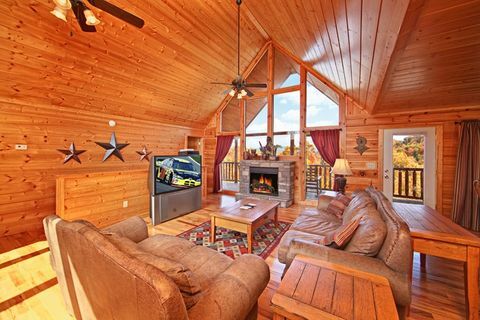 Stay connected with this cabin's free Wifi Internet. 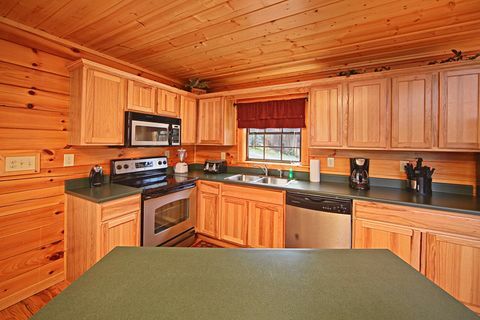 A washer and dryer also provide cabin convenience. 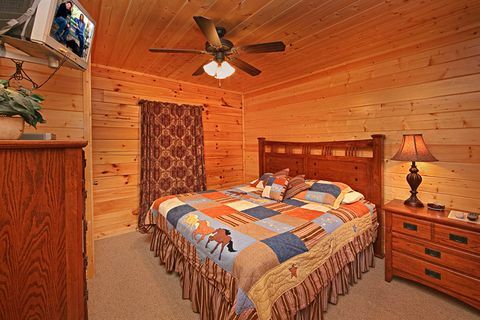 When it's time to turn in for the night, you can choose one of comfortable four bedrooms. 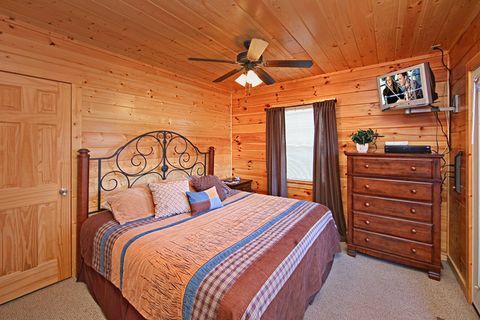 Each offers a comfortable king-size bed and television for visitors' personal entertainment. 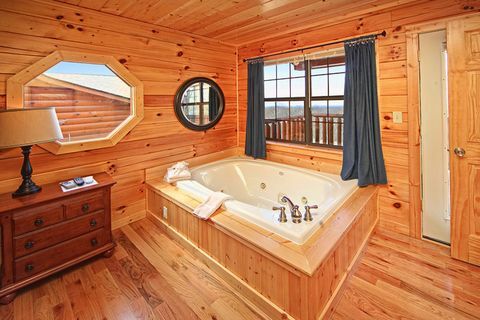 The master suite features a jacuzzi tub and private access to the cabin's rear porch. 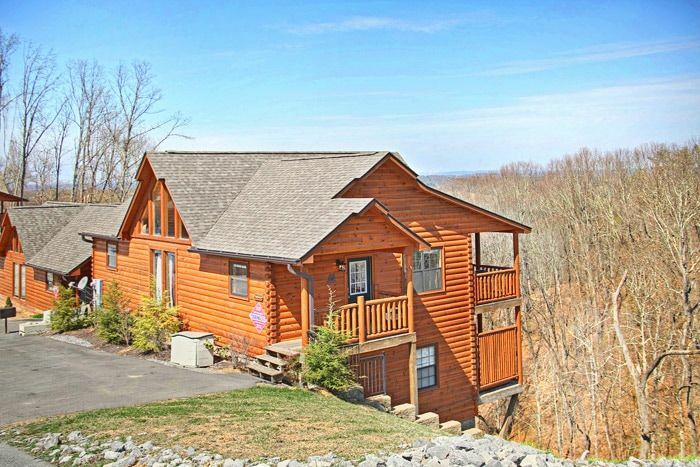 With two sleeper sofas, this cabin sleeps up to 12 guests comfortable. Come join the fun and discover why millions of families stay in their own Pigeon Forge cabin year after year for a unique Smoky Mountains vacation experience. 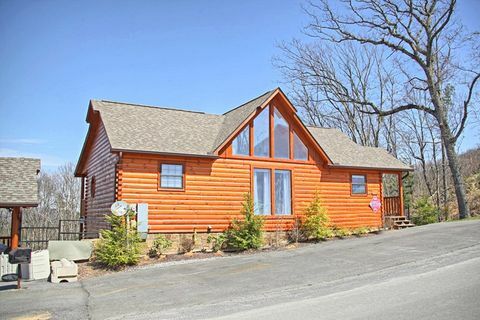 Book this Dollywood cabin in Hidden Springs Resort online with Cabins USA and start SAVING with an immediate Online Cabin Discount!